I am not alone in saying that the Miners Ridge/James Irving loop is perhaps the most beautiful redwood hike in California. It's got miles and miles of quiet, untouched, pristine, old growth redwoods, a magnificent beach complete with elk roaming the rugged shore, and the prime evil fern canyon that feels so much like a time warp they filmed scenes from the movie Jurassic Park there. 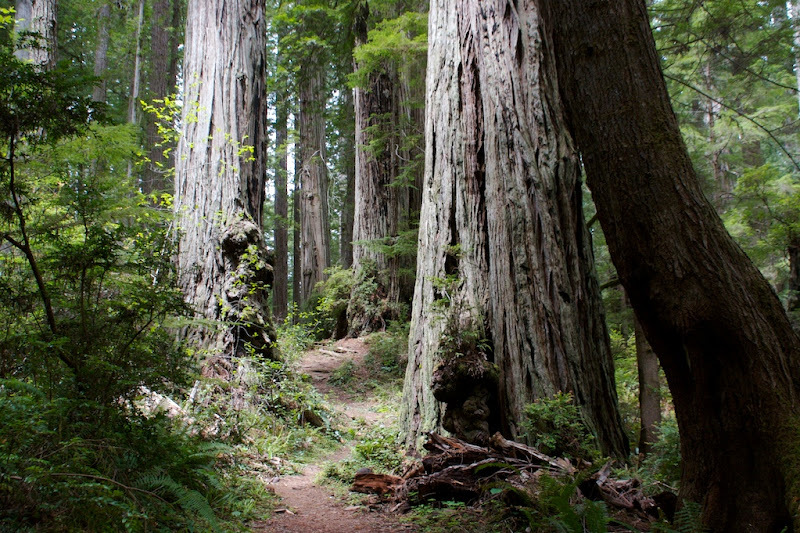 Rain or shine, the 11.5 miles of trail winding through the heart of Prairie Creek Redwood National Park should not be missed. This hike is nice in nearly every season, it's cool and sheltered in the summer and fall, protected from the rain in the winter, and the spring brings a lush forest filled with moss and wildflowers, and very mild temperatures. Redwoods near the start of the trail. The trail starts out just across from the Prairie Creek Visitors Center. 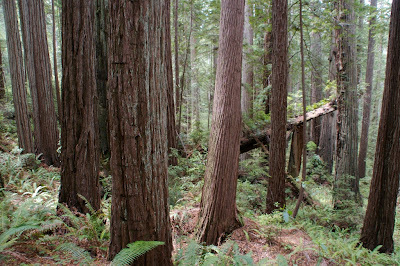 After crossing several bridged creeks the trail kicks back and begins to climb, slowly, into the old growth forest at the heart of the state park. After only half a mile the trail is surrounded with towering redwoods, the sparse ground cover allows visibility deep into the forest, and immediately I knew this trail is something special. After about half a mile the trail splits, both directions are part of the loop, but we kept to the left on the Miners Ridge trail. My hiking partner Andrew and I stopped constantly to take pictures of the ancient giants, each gnarled old titan seemingly more impressive than the last. Every corner as the trail climbs along through the forest took my breath away. Since we were hiking on a Monday afternoon we hardly encountered a soul on the trail. An older hippie couple chatted us up briefly near the Clintonia tail junction. The gnarled trunk of an ancient redwood. The trail gives a unique perspective on the redwood forest, especially as it nears the top of the ridge. 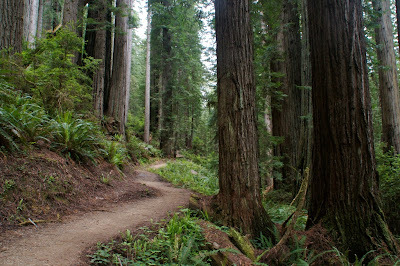 Unlike the ancient groves in Jedediah Smith we had visited the day before where our heads were constantly craned up to view the redwoods, on the Miners Ridge trail most trees can be looked on from about halfway up (depending on their distance from the trail). The topography remains actually quite gentle considering the trail does climb up and over a major coastal ridge, twice. Fungus on redwood trees in the transitional forest. After 3-4 miles the redwoods slowly begin to fade to a coastal pine forest, reminiscent of Point Reyes. These trees are not nearly as tall as the old redwoods, but the moss draped across old snags of deadwood gives it a similarly ancient feel. At this point the trail has descended back down the ridge and is nearly flat for the final mile out to the beach. After leaving the trail and following the main dirt road to the left for a couple hundred feet we were able to cut over to the Golds Bluff Beach camp. Golds Bluff Beach camp is perhaps the best campground on the entire redwood coast, surrounded by towering bluffs (gold in color, hence the name), and routinely the grazing ground for Roosevelt Elk who wander the outskirts of camp, it is a do-not-miss campground. It is only accessible via a 6 mile, suspension murdering, washboard road, but absolutely worth the trip. There is no bad campsite, except those perhaps in the middle of the loop. Roosevelt Elk just outside the Gold Bluffs Beach Camp. We snapped up our lunches down by the beach and moved away from the camp, knowing we would return that evening to find a campsite and explore the area more. We returned to the road and followed it for a third of a mile to discover a small parking lot. 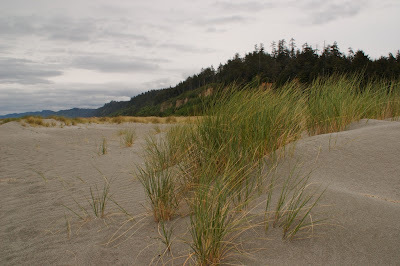 We were looking for an elk encounter and began hunting around in the grasses between the trees and the beach where they like to graze. We found brightly colored wildflowers in bloom, tucked between the reeds and grasses, as well as several ponds filled with ducks. 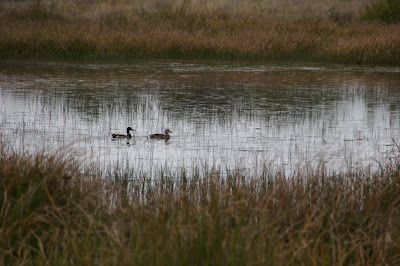 Ducks on the pond near Fern Canyon. After giving up on seeing some elk we elected not to delay any longer and begin the hike back to the visitors center, especially as the grey clouds looming overhead were slowly darkening up. By the time we entered Fern Canyon sprinkles were filtering down through the tree canopy. Had fern canyon been anything short of amazing we might have decided to keep our visit brief. Fern canyon is an aptly named stream cut canyon surrounded by 20 foot vertical walls encased in a green covering of ferns. The trail back cuts across the mouth of the canyon and then follows the rim above it. Any exploration we did into it we knew would be a side trip. Planks over the trail in the coastal pine forest. After leaving the canyon we continued back into the coastal pine forest surrounding the trail. 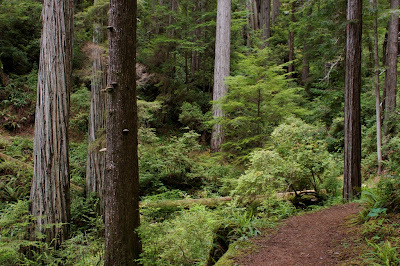 The trail slowly begins to climb as the coastal pines blend back into a thick Redwoood forest. We could hear the rain coming down, but down below such an expansive canopy hardly a drop was filtering through just a very fine mist. The remaining stretch of the James Irvine trail is quite similar to the Miners Ridge trail. Hearty stands of old growth redwoods that go on for miles and miles. 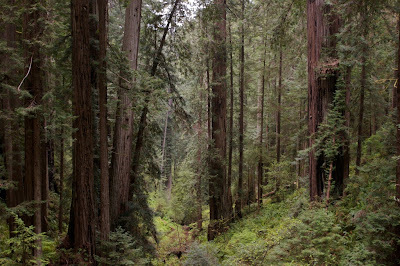 Back in the heart of the redwood forest. It's hard to imagine ever being sick of seeing such beautiful giant trees but by the time we reached the trail junction again we were ready for the hike to be over. The damp forest was beginning to make hiking uncomfortable and our legs were quite tired from miles and miles of trail. The last few bridges before the headquarters building were pleasant though as we knew snacks and more water were waiting for us back at the car. The heart of the redwood forest during a steady rain. After crossing the last bridge and returning to the parking lot I found myself already missing the old growth forest, so deep you could easily get lost in it. The heater in the car was a welcome treat though as my damp, and cold fingers and toes were ready to be thawed out. -The first one because the lighting is quite serene. 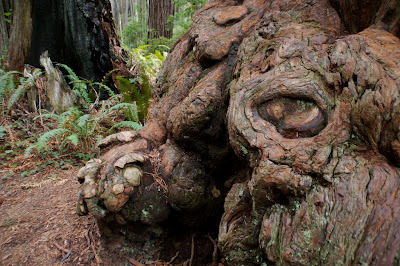 -"The gnarled trunk of an ancient redwood." It reminds me of an elephant or a rhino... so cool! -"Roosevelt Elk just outside the Gold Bluffs Beach Camp." Because it looks like it is posing and it also looks like you were able to get really close. 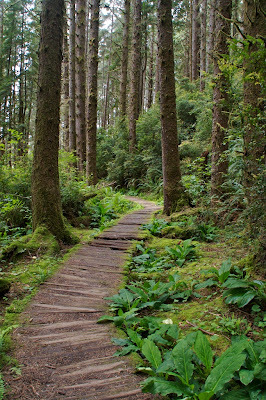 -"Planks over the trail in the coastal pine forest." Because the lighting is lovely and the curve of the trail plus the angle you took the photo makes it look very inviting. Nice post. I rarely get up there, but I love the north coast, and especially the redwood parks. Visiting the old growth forests is like some kind of pilgrimage for me. I'm planning a trip for maybe late September. Thanks for the comment Randy (and Beylah, of course!) I'd highly suggest paying a visit to Gold Bluffs Beach, if you've never been it's a must visit. Perhaps my favorite developed campsite so far. Ooh, some of my new favorite photos are on this post! The elk and ducks look like the start of an animal greeting card collection. That elk was surprisingly unfriendly, though I can understand why. After hanging around him photographing for awhile the elk eventually got peevish and curled up his lip and stomped at me, raising its monstrous antlers to the foggy sky. Clearly saying "okay, shows over, I'm trying eat here buddy, how about you move on now". 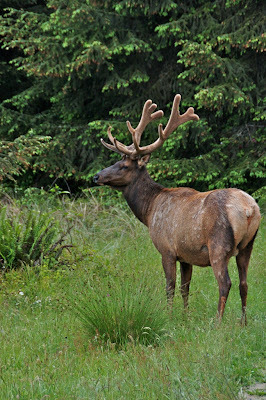 Though the elk are VERY docile it was a sudden reminder that they are still wild creatures. I felt fairly silly after that elk put me in my place. I'm planning to hike this trail for labor day weekend, is the trail easily follow-able without getting lost. Any other precautions to take, appreciate your response. All the trails in the park are quite easy to follow. Just be aware you'll have to backtrack in Fern Canyon once the canyon starts to narrow. I highly recommend walking as far down it as you can though. Just make sure to give yourself plenty of time to complete the full hike as it is a little lengthy. You don't want to have to rush back to beat the sunlight.